I tend a garden in LaMorinda that was planned to mimic the natural environment. It is large, beautiful, and although natural in appearance, somewhat complicated to maintain properly. When the homeowner approached me, she expressed frustration with her current gardeners and said she needed someone to manage the landscape that would understand the garden’s concept and is sensitive to the organic nature of it. Attention to detail was an absolute requirement. I gladly took on the challenge. Initially I had to address some deferred maintenance that had been overlooked by the previous gardeners due to lack of knowledge, but now the garden is thriving again. Every time we speak she expresses how much she enjoys her garden now. I work on an on-going basis with the property management group of a 60-unit townhouse complex on the SF Bay waterfront. I meet with them regularly to discuss the work being done by their gardeners. They spend $60,000 annually on landscape maintenance, trees and plants and they want an outside consultant to tell them they are getting good service for their investment. One problem we’ve discussed is the 25-year-old landscaping, including the trees and shrubs that block the homeowner’s views of the SF Bay. Homeowners were starting to chop down the growth in front of their windows themselves and it looked awful. I helped them to find plants that are low maintenance, would not block the views, and could withstand the wind and cold of the Bay, while looking lovely and keeping the coordinated look of the property as a whole. My client had rented her house out for several years, during which time the garden became somewhat weary. She made the decision to renovate the house with the goal to sell it at the end of the process. I worked with her over the course of a year to renew the landscape by adding and replacing plantings and caring for the yard so that it would be in its prime at the target date for the sale. Just prior to the first open house I added lots of pots filled with color-full blooming plants to invite people in through the front doors, and also out onto the new stone patio. I now consult with the new owner who tells me that one of the major factors in her decision to buy this house over others was the garden. A friend who cared for her own garden asked for my help when she was transferred to a job out of the area and she had to sell her beloved home. I added bright plantings in key spots to guide the eyes to the exterior details of the house which make it unique. I then placed colorful pots full of spring flowers at the front door to create a sense of excitement at the entry. Lively pots were placed on the back deck, which could be easily seen from the dining room, further emphasizing the connectedness in this home of the interior to the outside garden. Her real estate agent remarked that it was the most complimentary garden staging she had ever seen. 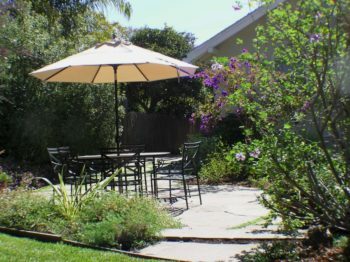 Sally Dinwoodie Landscape Maintenance works in Orinda, Moraga, Kensington, El Cerrito, Berkeley, Pt. Richmond, El Sobrante and other SF East Bay cities. To learn about me and how I work with my crews, please visit the About Sally page. Or please visit the What to Expect page for information on estimates.